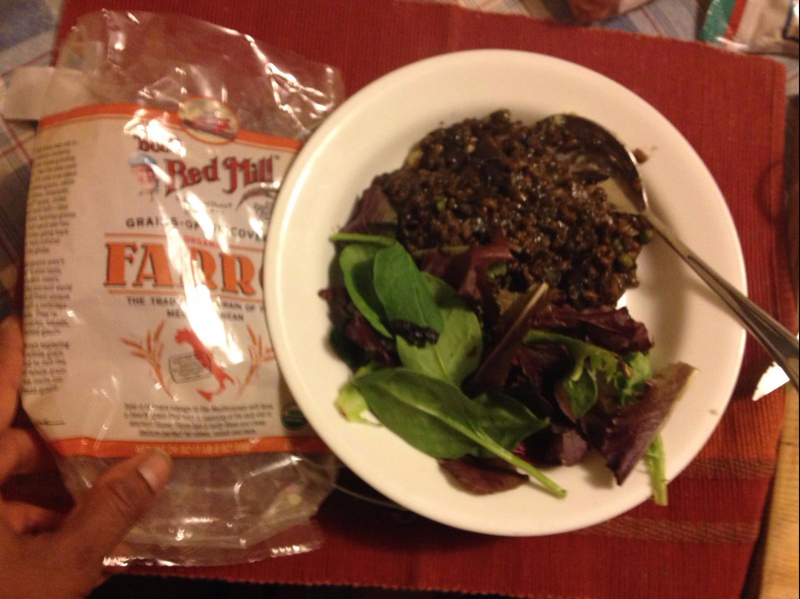 As the delighted recipient of a bag of Bob’s Red Mill Farro from my dear friend Lisa who keeps introducing me to new ancient grains, I perused the recipe printed on the bag and became, if such a think can be imagined, even more delighted because I actually had the ingredients. They are: vegetable stock, olive oil, onion, garlic, farro, mushrooms, green peas, butter, cheese, black pepper, and salt. Now the recipe printed on the label also calls for 1/4 cup dry white wine (optional) but as the instruction say “Add white wine, if using …” I concluded that we could safely omit the white wine. Also if you are amazed that I so glibly said that I had the very first ingredient on the list, namely “vegetable stock” the fact is that I had no such thing. What I did have, was the reassurance from none other than Mark Bittman that in lieu of soup stock, I could use water enhanced with pesto. And I had pesto! What I have never had is Risotto. The recipe introduces itself by calling it a “new spin” on risotto. Notwithstanding the inherent discouragement inspired by such a statement, I forged ahead after duly soaking half a cup of farro overnight. I had already ground the remaining farro into flour, which I used to make bread using this recipe for Farro Nut Bread from Flavors of Italy. Back to the farrotto, it was yummy. And filling, too. Will certainly make again.